Polish and Spanish! It is truly exciting. 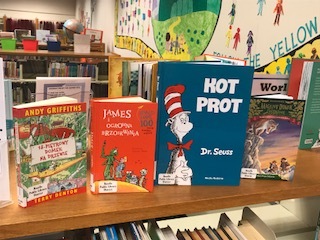 While we also purchased favorite tales originally told in Poland, we also updated our collection to have titles by other internationally renowned authors such as Dr. Seuss, Andy Griffith, Roald Dahl and Mary Pope Osborne. We have also been looking to add more nonfiction selections, especially about animals. Children love to learn more about animals. To our Spanish collection we have added Sarah Weeks' Counting Orejas, along with a classic of Mother Goose Tales, La Madre Goose. 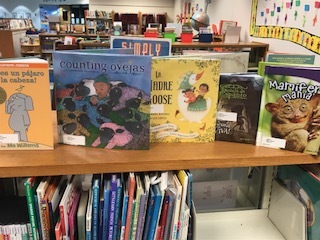 The Spanish nonfiction collection is also increasing in size with the addition of counting books and information titles about animals. The ever popular series, Eerie Elementary by Jack Chabert also has been purchased along with the 2019 Caudill Nominee, Magisterium: La Prueba de Hiero by Holly Black and Cassandra Clare. We are always looking for ways to best serve our bilingual population, so if you are aware of titles you think our collection should have, please let one of our librarians know so that we can pursue the request. In the mean time, please enjoy our new books. They are here waiting for you to take them home and read with your family!